Wajahat Rauf’s upcoming web series ‘Enaaya’ is a musical drama which revolves around love, heartbreak and of course music. The web series is about a group of university friends who form a musical band. Moreover, the character of Enaaya will be played by our very own, Mehwish Hayat. 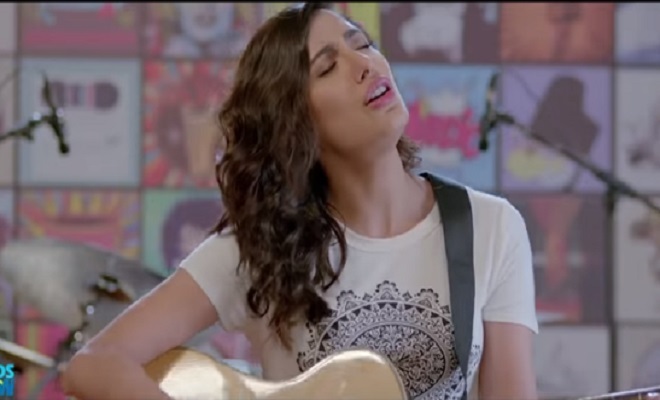 A knight in shining armour – Mehwish’s character is of an outgoing and frivolous girl, whose singing skills prove to be a valuable addition to the band. The star studded cast of the show also includes Azfar Rehman, Faryal Mazhar and Azhar Siddiqui. However, this isn’t any other boy-meets-girl musical drama. Azfar, who’s playing the role of Jimmy is burning with the desire of winning a music competition. And he’s willing to go to any lengths for that win! Enaaya’s vocals are the redeeming grace of God for this band. However, as they say, you can’t please everybody. Faryal’s character is not very welcoming towards Enaaya and that’s where the drama starts. Faryal is seen to be in a constant rift with Enaaya. The trailer of the web series begs the question, Will Enaaya and Faryal bury the hatchet for the sake of the competition? Most importantly, will they win the competition? Well, you’ll have to keep up with the series to find out. Enaaya is one of those series the Pakistani drama industry needs. A one of its kind, Enaaya is a rollercoaster of emotions. Produced under the banner of Eros Now, the web series will be available for viewers to watch on January 21st. However, since it’s an Eros Now production, there’s a downside. The web series will only be available on the official website, and to watch the show you’ll have to buy a subscription. Let’s hope the series lives up to the hype it has created.